Don’t know about the turbo, but if you’re in the UK you’d better get the dpf fitted again or it’s an instant MOT fail. Looks like you should be rejecting the car as not legal when sold to you. In short, it’s illegal – since 2014, it has been an MOT failure, and as of spring 2018, the MOT test is going to become much more stringent. 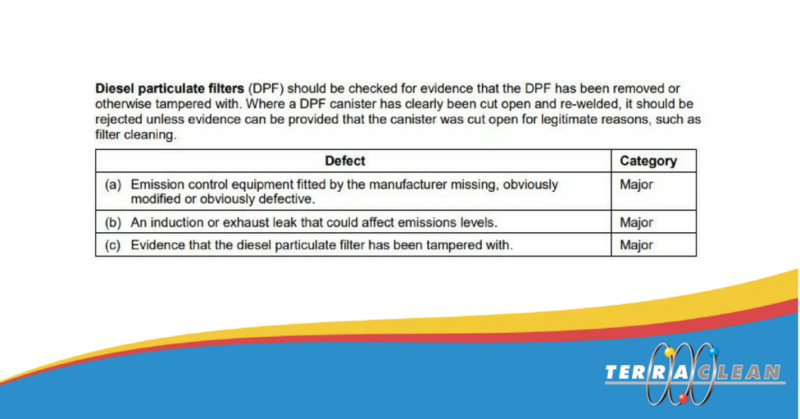 The MOT DPF check has been flawed – it relies on a visual check only, and it can be difficult to tell if a DPF has been removed just by looking. Anybody’s car with a removed DPF could face a fine, or a bill of potentially more than £1,000 to replace the part. The internet is, of course, full of people who will tell you they’ve had their DPF removed and never had a problem, and there are plenty of companies advertising DPF removal and making it look like a viable solution to a clogged DPF. Don’t listen: they might not have had a problem before, but there’s a strong chance they’re getting caught out soon. If you are buying a second-hand diesel car in the next couple of years, we strongly recommend you do so with extreme caution. Insist that it has a full 12-month MOT and ask if it’s had its DPF removed. If you buy a car with no DPF, you could be facing a huge bill next time it requires an MOT. Thousands of drivers have been caught driving without their diesel particulate filter, new figures reveal. The Driver and Vehicle Standards Agency has caught 1,800 drivers since 2014 driving with the pollution-reducing filter removed from their car. While it’s not illegal to remove a car’s DPF, it is illegal to drive without it if one should be fitted. It’s believed some drivers whose DPFs become blocked are simply bypassing the filters by removing them rather than paying for a replacement, which typically costs around £1,000. In doing so, car drivers are risking a £1,000 fine, while the penalty for driving a van without a DPF stands at £2,500. I'm in Ireland we bought car and after a few hours dpf filter light came on it got stuck in regeneration mode.so the removed insides of filter and bypassed it now 18 months later turbo blows. Well it's always useful to have the full information! I haven't a clue as to the regulatory structure in Ireland so you'll have to research that yourself. Also I'd assumed from what you said the turbo failure was close in date terms to the DPF removal. 18 months is a VERY long time for it to be consequential so I'd suggest you can rule that out completely. "Another car fail NCT with DPF removed. So think twice before you remove DPF !!!" Under English Law I believe you could still reject the car if it was sold to you with the DPF removed and not declared - less allowance for use over the time period. But the turbo failure complicates that! However I'm unclear as to the conflict between: "...I only found out that the dpf filter was removed by another garage..." and "... after a few hours dpf filter light came on it got stuck in regeneration mode.so the removed insides of filter and bypassed it...". So you didn't know until recently? And the garage actually made the car unroadworthy after you'd bought it? Its either been removed or it hasn't. You had it done or it was done before you bought the car. You cannot expect help on here if you cannot even tell us the true facts. If its been removed then it needs replacing asap before your next MOT or it will fail. If its still on the car then it may be faulty and need fixing or replacing. Its omission or possible fault should not have affected the turbo. More likely that low oil level, degraded oil, or misuse is to blame for the turbo failing.